Note: This is the 11th post in our "Species of the Month" series, written by Park Ecologist Peter VanLinn. It's one of several 2014 initiatives meant to share knowledge we have about the Park with those who love it. Have you ever walked through part of Forest Park’s Nature Reserve and wondered why a big, dead tree is left standing in the middle of a prairie or wetland? One reason is to support additional habitat for wildlife that call Forest Park home. The American Kestrel (Falco sparverius) is a just one great example of a species that utilizes dead standing trees for habitat. These small falcons use the bare dead branches as perches to find food and are the only falcon or hawk to utilize the cavities of trees and man-made structures for nesting. In fact, just recently Forest Park Forever staff noted the return of a breeding pair that have been observed near the wetlands of the Deer Lake natural area. These birds have exceptional coloring and look even better against the contrast of fall leaf color as well as the bare tree branches this time of year. Forest Park Locations: Most commonly spotted in the trees above the Deer Lake natural area wetland and savanna, near the Franz Sigel statue. Description: The slender American Kestrel is North America’s smallest falcon (about the size of a Mourning Dove), but one of the most colorful. Males carry a slate blue color on their head and wings that contrasts well with the rusty red on the back and tail. Females carry the same warm rust color across their wings, back and tail with narrow black bands on the tail as well. Both sexes have two black stripes over white cheeks on the face. In flight, the wings are often bent, and the wingtips are swept back. They are often seen hovering. Distribution: Widespread throughout the Americas, stretching from Alaska southward all the way to the southern tip of South America, permanently residing in all or parts of 35 of the 48 contiguous U.S. states. They migrate and are only summer-breeding residents in eight northern U.S. states from Montana East to Michigan and Maine as well as parts of Canada. They are winter residents in Eastern Mexico and Central America. Status: A common (occurs regularly and in large numbers) migrant, common winter resident in southern Missouri and an uncommon summer resident statewide. Habitat and Conservation: Kestrels prefer farmlands as well as urban and suburban areas. They are the only cavity-nesting falcon or hawk. Many of the old-growth trees used for nesting are cut and removed in urban and suburban areas, causing a decline in numbers in some areas. 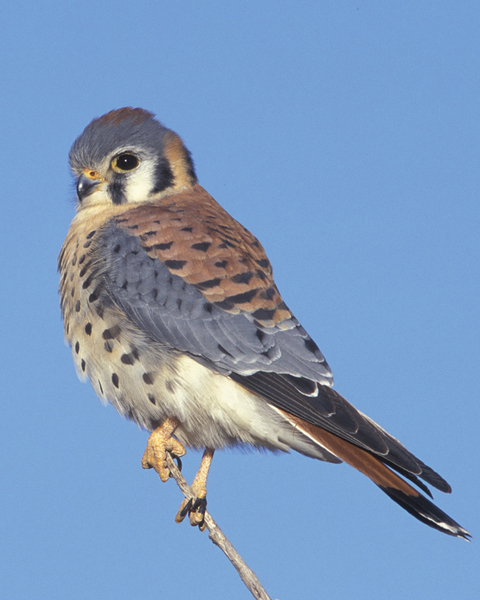 Kestrels are Blue-Listed by the National Audubon Society. Life Cycle: Kestrels for monogamous pairs and nesting begins in March, and 3-7 pinkish eggs with brown spots are laid in April. The female does most of the incubating for almost a month, while the male hunts for her. Young kestrels fledge from the nest after nearly a month. Young reach sexual maturity at around one year. Behavior: American Kestrels are diurnal hunters and use three different hunting methods: hovering, perch-hunting and in-flight capture. Kestrels often pump their tail while perched to help keep balanced. They prefer to nest in natural or man-made cavities. Food: Diet changes seasonally, consisting primarily of insects during the summer and small birds, mammals, and reptiles during the winter months. Human Connections: These small raptors are frequently represented by birders because of their graceful flight and attractive plumage. Many people have built and installed nest boxes to help improve nesting ability for the species and to watch the birds as they raise and feed their young. Ecosystem Connection: Kestrels focus on smaller prey than other larger raptors, helping to keep small wildlife species populations in check. Note: Information has been collected from The National Audubon Society; The Cornell Lab of Ornithology; The Missouri Department of Conservation Field Guide: and the University of Michigan’s Animal Diversity Web.